Download the Table Saw Test 2: Checking Arbor Flange and Saw Blade Run-Out Manual. If you have ever watched a saw blade “wobble” to a stop and wondered what is wrong with your saw, this test will help you understand what is causing the problem. A-Line-It set up on a left tilt saw. The “Spring and Nut” assembly required is included with the “Deluxe” kit, and can be added as an accessory to the “Standard” A-Line-It. The purpose of this assembly is to bias the saw blade securely against the arbor flange, but allow us to independently rotate either the blade or arbor. To give you a brief overview of the purpose of these tests: If we rotate the blade, but not the arbor, the deflection of the pointer on the indicator shows the run-out of the blade. If we rotate the arbor, but not the blade, the deflection of the pointer on the indicator shows the run-out (near the teeth) that is caused by the run-out in the arbor flange. When making this test, I would recommend that you use the miter groove on your saw that is closest to the saw blade, as shown in the photos to the left. In the top-left photo, you can see that the A-Line-It “Smart Bar” is installed in the left miter groove. In the bottom-left photo, you can see that the A-Line-It “Smart Bar” is installed in the right miter groove. By doing the tests in this manner, you should have room to get your hand near the arbor without interfering with the dial indicator. Thoroughly clean the arbor flange and saw blade to insure there are no burrs or contamination on them that can cause improper readings as you make the following tests. Assemble the A-Line-It components as described below. A-Line-It set up on a right tilt saw. Step 1. Install the 2 nylon locking screws into the nut, making sure they do not extend into the center hole in the knob. Step 2. Install the spring into the large countersunk hole in the knob. Step 3. Place a blade on the arbor, and install the blade washer. Do not install the factory arbor nut. Step 4. Place the spring and nut assembly onto the arbor shaft, and press the nut toward the blade to compress the spring. Tighten the 2 locking screws to hold the spring and nut on the arbor shaft. When done properly, the spring should keep the blade firmly biased against the flange of the arbor. Step 5. Elevate the blade to its highest point, and then lower it about 1/8” to 1/4”. Step 6. Assemble the A-Line-It as shown in the appropriate photo above, and position it in the miter groove on the saw. Rotate the indicator tip downward, without making contact with the table saw top. Step 7. Zero the dial indicator. 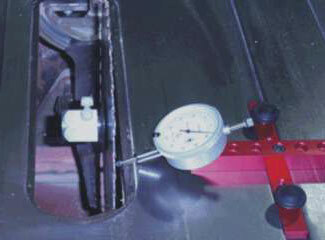 To check to insure the blade is firmly biased against the flange, push the blade away from the flange, and release it. 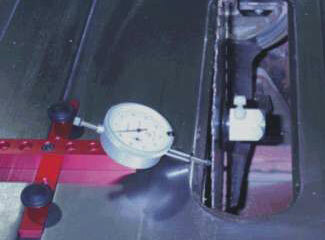 If the dial indicator consistently returns to “zero”, the spring and nut are properly installed. If the reading “ drifts” when the blade is released, more tension should be placed on the spring. The following procedure will allow you to test run-out produced by the arbor flange. Step 1. Place a small strip of wood (I’d use something about 1/8” thick by 3/4” wide, and 10” or so long) directly in front of the saw blade. The long dimension should be parallel to the blade. Step 2. Slide the piece toward the blade, placing one end of the strip into one of the gullets (notches between the teeth) on the blade. Step 3. Position the A-Line-It so the tip of the indicator is close (not on) to one of the teeth on the blade. Step 4. Grasp the spring and nut assembly with one hand, and hold the strip of wood with your other hand. Rotate the arbor shaft in the normal direction of blade rotation. A tooth on the blade should catch on the strip, stopping blade rotation. Step 5. Zero the dial indicator. Step 6. While holding the strip, slowly rotate the arbor of the saw. The dial indicator will show you how much run-out there is near the outer edge of the blade that is caused by run-out in the arbor flange. Though I have never been able to get “factory specs” on this subject, I wouldn’t be greatly concerned as long as the amount of run-out didn’t exceed .005” (five thousandth of an inch). The following procedure will allow you to test run-out in your saw blades. Step 1. Slide the A-Line-It to a position that places the tip of the indicator just inside the gullets on the blade. (It should be in a position that allows you to rotate the blade without the indicator tip getting into one of the gullets as you rotate the blade. Step 2. Grasp the spring and nut assembly, and hold it with one hand. Step 3. Use your other hand to slowly rotate the blade. (Be sure to take your hand off the blade frequently to insure you are getting accurate readings. The indicator will show you the amount of run-out in your blade. NOTE: A high quality blade will typically show run-out of less than .003” (three thousandths of an inch), while many lower quality blades can have run-out in excess of .010” (ten thousandths of an inch). Excessive run-out in a blade will result in saw marks on the pieces you cut, which need much more sanding to smooth the surface of the cut. If you want to get the best possible cuts from your saw, a high quality blade is essential. One of the benefits of making the above tests is that when the tests are done, you will be able to identify the “high spot” and “low spot” of the run-out on both the arbor flange and the saw blade. If you mark the “high spot” on one, and the “low spot” on the other, you can install the blade on the arbor while indexing these 2 points together. This allows you to minimize the total amount of run-out near the teeth of the blade.